We all are looking for the perfect job! But is it easy to find? Of course not! Like the old and wise have already stated earlier, the best things in life take much longer to find. Clearly it will take you some time to find something you want the most. Not only does it require you to be patient but you are also expected to follow a couple of rules and regulations. When you are looking for a job, you must know ways in which you can skip the bad ones and focus on the good ones only. Wondering how you should do that? Don’t be! Because in this post, we are going to discuss with the top ways in which bad job offers can be avoided in the future. Hopefully you will find some help in the following paragraphs! How to Recover From Bad Career Choices? In order to know whether the job you are about to do is ideal for you or not, you have to get complete information on the company you are working for. Speak to the clients, employers and hiring manager in order to get a grasp of the behaviour and try to learn about the working environment. If it isnt all that healthy, you will definitely know. So wear your thinking caps on, learn to be a bit more observant when you are at office and try to understand the work culture there. If you want to learn how to avoid a bad job, you need to first know your history. Confused? Don’t be. If you didn’t know, some people tend to make the same mistakes over and over again without even realizing and this could be you too. So the best thing to do in such a situation is to simply look back at your history and try to learn as much as you can from it. If you can find a couple of places where you’ve gone wrong, make sure you change them. This will make it easier to find a better job in the future. Everything specific or important about your previous job and a list of things you should definitely avoid. You can also mention some of the things you disliked the most about the job environment. Add some interesting things such as life experiences you have had in schools, colleges, internships and vacations. Once your list is ready, rate each item out to ten in terms of avoidance. You will know towards the end what you dislike the most. That will definitely help you avoid. Questions that must definitely be asked when the interview is being conducted. Speak to the co workers and go out with them so that you can know who they are. Just checking on how your next boss treats his other colleagues. Talking to the receptionist in order to know more about the company. One of the smartest things you can do in order avoid a bad career choice is by simply staying focused. Don’t let your parents, family and friends distract you into doing something you didn’t want to in the first place. Making money feels great but when you are not enjoying what you do, then it’s probably time to back off and do something that you love doing. So the key here is to stay focused on what you want to do and go forward with that. Yes! It must be a great feeling to earn a lot of money but if that is all you are going to chase, then you probably will end up with the wrong career choice. If you didn’t know, job satisfaction is more reliable on personal happiness than anything else. So if you are chasing money, stop it right away. It will not help you land the job of your dreams. Neither will you be happy with life in general. Always care about your personality and know who you are. Do not make the mistake of avoiding your skills, traits, characteristics, values and aptitude. All of these traits are a part of you and can never be changed. When you are looking for a job, you must find something that matches all of these traits. That will prevent you from making future mistakes and also avoid a bad job choice. If you don’t take this into account while hunting for the right career opportunity, you might just miss out something that has been made especially for people like so. So be very careful. A good career choice is often associated with location. If you are really keen on finding the job of your dreams, you should be stable enough to relocate when the need arises. This is obviously much better than finding something you don’t like within the location you already reside in. Plus if you aren’t willing to relocate, it will be difficult for you to finally achieve what you want. So make sure you are financially well off so that shifting location is never a big problem for you. If you want to avoid a bad job offer in the future, you have to care about it in the first place. Since you cannot pick something based on what the world considers to be the best career list, you cannot ignore the concept of employment either. Of course you are not a fortune teller so you may not be able to predict the future. You will never know whether the company will grow or decline. So the maximum you can ever do is just hope for the best. In case the future looks a little bleak, you can leave the job too. 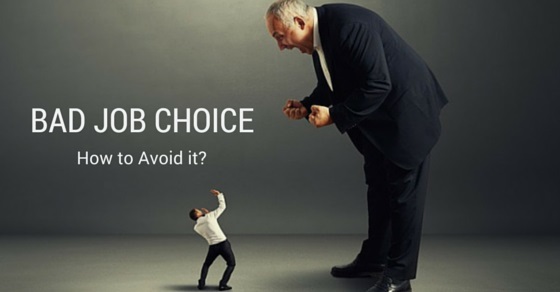 It is very important to speak to both the members, staff and co workers if you want to know whether the choice that you are about to make is good for you or not. Your homework is not complete until you do a full research. People who are mostly occupied with this sort of occupation can give you an honest detail of what it is all about to work with a company like this. If it is possible, speak to a few people. One of the biggest mistakes people make these days is following others footsteps. Yes, it is great to have a role model but if you do everything that your mentor is doing, chances are you wont be following what your heart wants you to. And that leads to complete disaster. This person could be anyone; from the person who fed you as a toddler to the professor who taught you at school. The bottom line is that it is harmful to try to become an exact replica of these people. When you are looking for a fine career opportunity, it can be quite difficult to reach your goals; especially with the pressure most youngsters have to put up with from family and relatives. It could be related to financial status or even because of differing opinions. The point is that, it is often tough to avoid a bad job because the person probably isnt left with any other opportunity. However, these tips and ideas should definitely pull you out of your misery and help you achieve the best job! Here’s hoping that you find great success in whatever you do and may you fulfil your desires in the future.